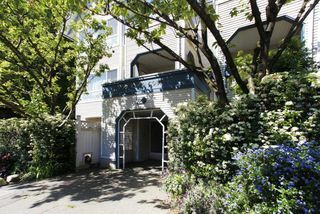 Beautifully updated one bedroom city home in Woodland Court, a unique building with a courtyard garden and open air hallways located on a pretty tree-lined street near eclectic Commercial Drive. It is bright inside with East and West facing windows, a spacious eating area adjoining the galley kitchen and a comfortable living room with a gas fireplace and adjoining balcony, California en-suite bath, in-suite laundry and more. Pet and rental friendly building. Parking and storage included.